Summer time ….. and the learning is relaxing. The regularly scheduled school year is over. But just a week and a day later I am back in my classroom with a roomful of students. The difference? This is summer school. I can suggest the classes I would like to teach and the students sign up for what they are interested in learning more about. There are not assessments. No grades. Just relaxed learning. Joyous! The first class each morning is my Real Script class. The students are learning to relax their hand and let the pen dance across the page. 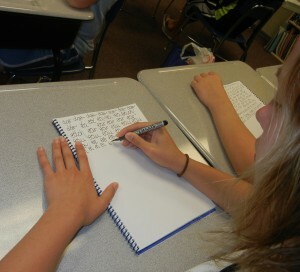 In the following two pictures you can see that the students are focusing on proper posture and a proper pen hold. 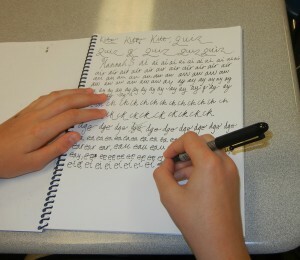 It is important to keep the index finger relaxed and in control of the pen’s movement. In the two pictures you can see two different pen holds. The one in which the pen is between the two fingers is called a plume hold. Back in the days of dipping bird plumes in ink, many held their pens in just this way. As you can see the other thing we are currently working on is ligatures. We are practicing writing digraphs and the ligatures that connect the two letters. 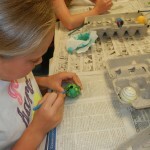 Another class that I am teaching (back by popular demand) is Ukrainian Egg Decorating. 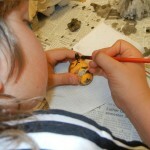 Years ago I bought a kit so that my children could make Christmas presents for their grandparents and teachers. 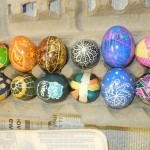 My daughter and I enjoyed it so much that we’ve spent many hours creating beautiful eggs. 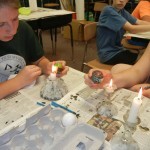 Students begin with a white egg. They use a tool called a kitsky to draw lines of beeswax on the egg. The kitsky is warmed over a candle flame to keep the beeswax flowing. 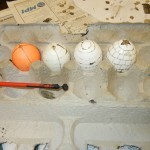 Once the design on the white egg is completed, the egg is placed in a dye. I have 12 different colored dyes, the lightest being yellow and the darkest being black. 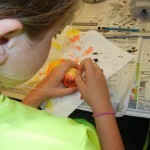 As each successive dip in a dye is sealed with beeswax, the egg becomes covered with color. Once the egg is finished, all of the beeswax must be removed. We do this by holding the egg close to the flame. As the wax become glassy looking, the wax is wiped off with a paper towel. After all of the beeswax has been removed, I take the eggs outside to spray them with a clear coat that will seal in the colors. The next day the eggs must be emptied. I have some tools for this that make it rather easy to do. And now the egg is officially finished! One of my favorite quotes is this: “Education is learning what you didn’t even know you didn’t know.” It was written by Daniel Boorstin, and I think it sums up our year together nicely. It is always amazing to me how quickly September becomes June! We have shared some really great moments together and made memories that will last. Enjoy this slideshow! The following film is something I had fun putting together. I believe it embodies the spirit and lightheartedness we have shared this year. Who says grammar has to be boring? Enjoy!